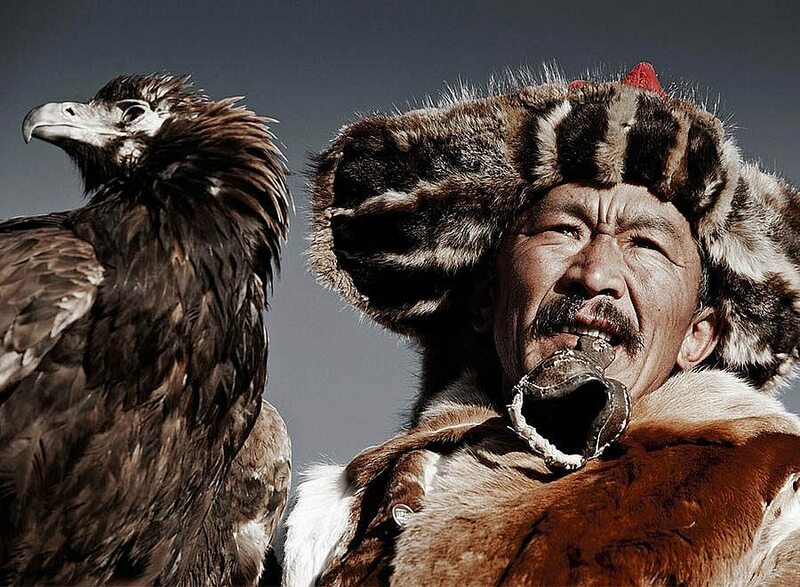 This shot of an indigenous Kazakh man with an eagle epitomizes Jimmy Nelson’s photographic style – raw, historical, and breathtaking. Starting off as a young traveler in 1985, Nelson took on photography to document cultures, and he soon gained a curiosity towards indigenous peoples. Already achieving international acclaim in his 20s, Nelson eagerly continued traveling, capturing photos of war, indigenous cultures in China, and ultimately, a group of 35 indigenous communities in his “Before They Pass Away” anthology. On top of his photography, Nelson utilizes his wide international acclaim to passionately lead fund-raising efforts for victimized and marginalized populations throughout the world. In this photo, the Kazakh man, likely a Uighur, is literally side-by-side with nature. He holds a striking eagle and gazes out with a strained face, perhaps due to the sunlight or the struggle of his activities. His beautiful garments reflect not just his deep connection to the nature and land around him, but they also reflect a simpler state of being where primary concerns might be finding warmth in cold weather. He clutches some kind of cloth between his teeth, possibly a strap for holding the eagle. Perhaps most striking is the contrast between this man and his reality. On the one hand, he appears strong, skilled, and weathered by life’s hardships. On the other, his way of life is threatened and marginalized. Like the bald eagle by his side, his fierce appearance belies his true struggle: survival in the modern age. I feel nostalgic for a time when people and nature were one. I am reminded of how, in some ways, our world has become a kind of warped dystopia. In the 21st century, survival and success hinge on higher education, technological prowess, and business smarts, rather than the most fundamental skills of finding food and water. Nelson’s photographs help me see that in a way, the greatest threat to humanity is not hunger or violence, but instead, assimilation. Those in historic communities who resist integrating into our constantly changing society risk being steamrolled and marginalized in the name of “progress” and their thousand year old invaluable wisdom lost altogether when modern society would benefit from it the most. Nelson's photographs help me see that in a way, the greatest threat to humanity is not hunger or violence, but instead, assimilation. The similar coloring of the eagle’s feathers and the man’s fur hat connect the two beings, revealing their kindred spirits and conjoined nature. Both man and bird are strong, powerful, and graceful in their demeanor. Conversely, the side-by-side composition asks us to consider all the ways in which these two beings differ. I think this pictures unravels all the advantages and limitations of both mankind and the animal kingdom, and it asks us to think about how far we have progressed from our natural state.